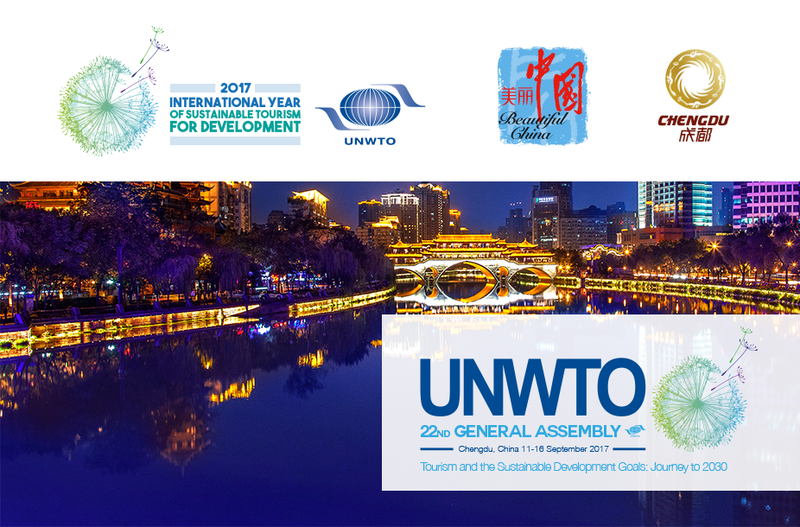 Luncheon on the occasion of the International Year of Sustainable Tourism for Development, 2017, hosted by UNWTO, GTERC and IHG (by invitation only). In view of the limited capacity of the room, we can welcome one person per delegation. The Invitation letter will be required for attendance. Dujiangyan irrigation system was built more than 2000 years ago (about 256 ~ 251 BC) by the Shu Satrap Li Bing and his son. Jinsha Site Museum is recognized as the most important archaeological discovery of China in early 21st Century. Kuanzhai Alley is one of the three major historical and cultural conservation areas in Chengdu, which is consist of three lanes: Kuan Lane, Zhai Lane and Jing Lane. Dujiangyan irrigation system was built more than 2000 years ago (about 256 ~ 251 BC) by the Shu Satrap Li Bing and his son. The Research Base of Giant Panda Breeding is one of the world´s famous research and educational bases all over the world. The Research Base of Giant Panda Breeding is one of the world´s famous research and educational bases all over the world. Dujiangyan irrigation system was built more than 2000 years ago (about 256 ~ 251 BC) by the Shu Satrap Li Bing and his son. Wuhou Temple is much associated with the kingdom of Shu, and it is the place to commemorate Zhu Geliang, who was the Prime Minister of Shu kingdom. Walking in this street, historic lanes, old official residences, vernacular dwelling, inns and shops will bring you back to the ancient China. Jinsha Site Museum is recognized as the most important archaeological discovery of China in early 21st Century. Kuanzhai Alley is one of the three major historical and cultural conservation areas in Chengdu, which is consist of three lanes: Kuan Lane, Zhai Lane and Jing Lane. Jinsha Site Museum is recognized as the most important archaeological discovery of China in early 21st Century. Wuhou temple now is the national key cultural relics protection unit, national AAAA tourist scenic area, and first-class national museum. Jinli Folk Street was set up and opened for public in 2004, which is located in Chengdu Wuhou Temple Museum (three kingdoms historical sites) area. Du Fu Thatched Cottage is the home of Du Fu, a famous poet, was regarded as the “Sage of Chinese Poems" in the history of Chinese literature. The Research Base of Giant Panda Breeding is one of the world´s famous research and educational bases all over the world. Wuhou temple now is the national key cultural relics protection unit, national AAAA tourist scenic area, and first-class national museum. Jinli Folk Street was set up and opened for public in 2004, which is located in Chengdu Wuhou Temple Museum (three kingdoms historical sites) area. Jinsha Site Museum is recognized as the most important archaeological discovery of China in early 21st Century.Kuanzhai Alley is one of the three major historical and cultural conservation areas in Chengdu, which is consist of three lanes: Kuan Lane, Zhai Lane and Jing Lane. Du Fu Thatched Cottage is the home of Du Fu, a famous poet, was regarded as the “Sage of Chinese Poems" in the history of Chinese literature. Jinli Folk Street was set up and opened for public in 2004, which is located in Chengdu Wuhou Temple Museum (three kingdoms historical sites) area. A tour will be arranged to a famous nearby town Qianwei, including an experience of Jiayang Steam Train and a visit to Jiayang National Mine Park Museum and Suoluo Lake.